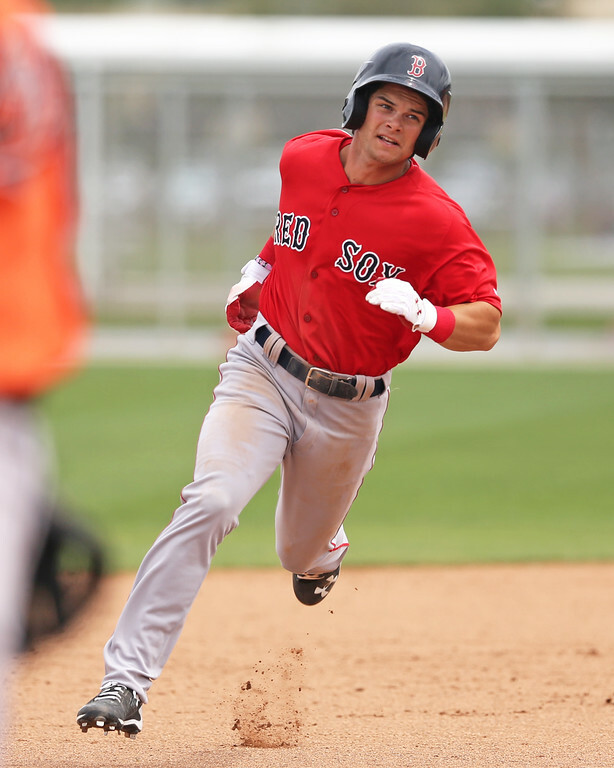 4/12 Cup of Coffee: It was a good night for the top prospects in the system, as Andrew Benintendi (pictured), Rafael Devers, Michael Chavis, Yoan Moncada, and Sam Travis all did damage at the plate while Brian Johnson shook off the rust in his first outing of the season. Ben Taylor and Daniel Gonzalez each turned in solid starts while Yankory Pimentel had another impressive night for Salem. After ulnar nerve irritation in his left elbow cut his 2015 season short, Brian Johnson eased into the 2016 season with four solid innings, allowing only one run as he threw 51 of his 76 pitches for strikes. He surrendered five hits, walked one, and struck out four on a night when a 20 mph wind was blowing out to center field. Roman Mendez was not able to keep the RailRiders at bay, as he was tagged for five runs over two innings, including a three-run home run that broke the game open. Anthony Varvaro went two scoreless innings, and Heath Hembree added a shutout inning of relief to keep the PawSox competitive. It was a disappointing offensive performance for the PawSox, as they collected only two extra-base hits. One of those was Sam Travis's first home run of the season, a solo shot in the ninth inning that cut the lead to three. Chris Marrero went 2 for 4 and Justin Maxwell went 1 for 3 with a walk, while Christian Vazquez went 0 for 3 with a walk and a throwing error, as he threw the ball away on a stolen base attempt at second base. A late comeback attempt was not enough as the Sea Dogs fell to 2-3 on the season. Ty Buttrey was wild, walking five and tossing a wild pitch as he was roughed up for three runs over 4 1/3 innings. Mike McCarthy finished the game off with 3 2/3 innings of two-run ball. Portland rallied for three runs in the eighth behind triples from Cole Sturgeon and Henry Ramos, but they ended up falling short. Sturgeon and Ramos each had two hits, and Rainel Rosario went 1 for 3 with a walk. It was another great night for the stacked Salem lineup, as they easily dispatched the Keys. Ben Taylor was solid in his 2016 debut, allowing one run on four hits, walking one and striking out five. Adam Lau earned the victory with two innings of scoreless ball, striking out three, and Yankory Pimentel worked around three walks in three innings to pick up the save. Pimentel has allowed only one hit and has not given up a run in his first 5 1/3 innings this year. Andrew Benintendi continued his hot start to the season, going 2 for 3 with a triple while driving in three runs. The triple was Benintendi's third on the season, which is equal to the number of singles he has in the early-going. Rafael Devers and Mauricio Dubon each went 2 for 4, with Devers adding a double, and Yoan Moncada went 1 for 3 with a walk but was caught stealing for the second time this year. With both starting pitchers having tremendous games, the Drive were able to win the battle of the bullpens to squeak past the Power. Daniel Gonzalez allowed only two hits over six shutout innings, walking one and striking out three. Jake Cosart picked up where he left off, striking out three over his two scoreless innings, and Kuehl McEachern pitched a perfect ninth with two strikeouts to earn his first save of 2016. Greenville's bats were quiet until the sixth when Trent Kemp and Luis Alejandro Basabe walked and came in to score on a Michael Chavis single. It was the fourth straight multi-hit game for Chavis, who went 2 for 4 and raised his average to .421 over the first five games. Joseph Monge was the only other Greenville batter to record a hit as he went 1 for 3 with a stolen base. Player of the Night: Andrew Benintendi was on base three times and drove in three runs in Salem's 5-1 victory. The 2015 Golden Spikes Award winner has not hit any speed bumps in his professional career, breezing through Lowell and Greenville last season before getting off to a hot start with Salem in 2016. The 21-year-old has already been hyped by Baseball America as being a Minor League Player of the Year candidate, and his start to the season is not giving fans any reason to be less excited.